Photo: newmy51. Creative Commons BY-NC-SA (cropped). Patricia Gualinga stands serenely as chaos swirls about her. I find this petite woman with striking black and red face paint at the head of the People’s Climate March in New York City on 21 September 2014. She is adorned with earrings made of brilliant bird feathers and a thick necklace of yellow and blue beads. She has come here from Sarayaku, a community deep in the heart of the Amazon rainforest in Ecuador. What I found in Sarayaku was not just a community defending its territory. I encountered a people who believe that their lifestyle, deeply connected to nature, holds promise for humans to save themselves from global warming and extinction. 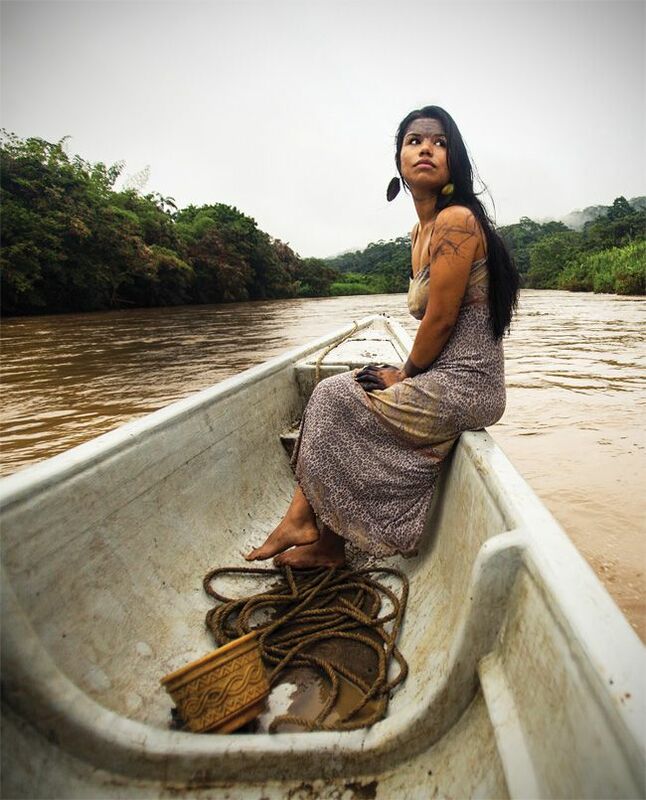 Nina Gualinga, Sarayaku resident and international activist on indigenous rights, traveling on the Bobonaza River, Sarayaku, Ecuador. Photo: Caroline Bennett / Amazon Watch. Sarayaku lies in southern Ecuador, where the government is selling drilling rights to a vast swath of indigenous lands — except for Sarayaku. The community has become a beacon of hope to other indigenous groups and to global climate change activists as it mobilizes to stop a new round of oil exploration. What I found in Sarayaku was not just a community defending its territory. I encountered a people who believe that their lifestyle, deeply connected to nature, holds promise for humans to save themselves from global warming and extinction. They are fighting back by advancing a counter-capitalist vision called sumak kawsay — Kichwa for “living well” — living in harmony with the natural world and insisting that nature has rights deserving of protection. 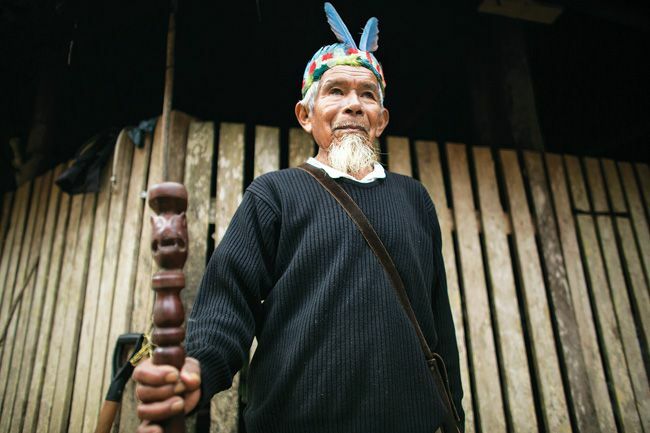 The people of Sarayaku are the face of 21st-century indigenous resistance. Sarayaku may be a remote, pastoral community, but it is engaging the Western world politically, legally, and philosophically. Patricia Gualinga and other Sarayaku community members have traveled to Europe to meet with foreign leaders and warn energy company executives about their opposition to oil extraction from their lands, produced their own documentary film about their struggle, filed lawsuits, leveraged their message with international groups such as Amazon Watch and Amnesty International, marched thousands of kilometers in public protest, and testified at the United Nations. Sarayaku’s resistance has angered the pro-development Ecuadorian government — which bizarrely hails sumak kawsay while selling hotly contested oil drilling leases — but has inspired other indigenous communities across the globe. “The community is in the middle of a three-day meeting to plan our political and development work for the next year. Come along — I think you will find it interesting,” he says, motioning for us to follow him down to the edge of the broad Bobonaza River. Photo: Matilde Martínez. Creative Commons BY-NC-SA (cropped). Ecuador’s government ignored the community’s refusal to sell oil-drilling rights and signed a contract in 1996 with the Argentinian oil company C.G.C. to explore for oil in Sarayaku. In 2003, C.G.C. petroleros — oil workers and private security guards — and Ecuadorian soldiers came by helicopter to lay explosives and dig test wells. Sarayaku mobilized. “We stopped the schools and our own work and dedicated ourselves to the struggle for six months,” says Santi. As the oil workers cleared a large area of forest — which was community farmland — the citizens of Sarayaku retreated deep into the jungle, where they established emergency camps and plotted their resistance. Photo: Knut-Erik Helle. Creative Commons BY-NC (cropped). 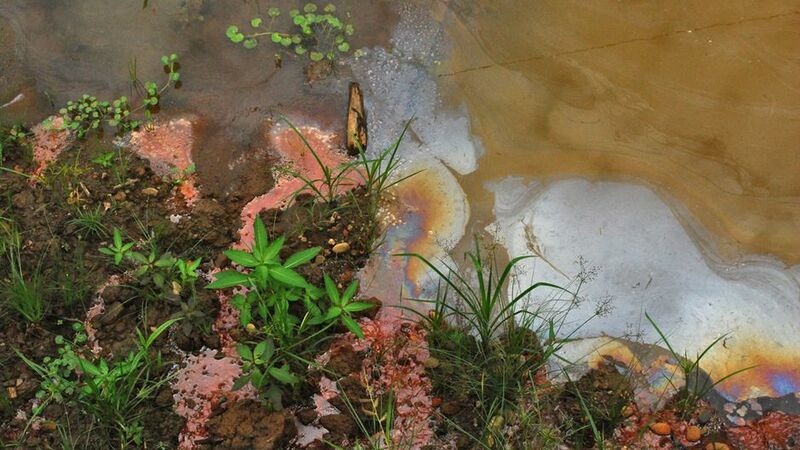 The Sarayaku residents ordered the petroleros off their ancestral land. The terrified workers called in helicopters and fled, abandoning their weapons. The oil workers never returned. An Ecuadorian general came later and negotiated with community leaders — five of whom had been arrested and beaten — for the return of the weapons. Sarayaku now wants to help indigenous people around the world resist and defend their way of life. “Our message that we are also taking to Asia, Africa, Brazil, and other countries that are discussing climate change, we propose an alternative development — the development of life. This is our economy for living — sumak kawsay — not just for us but for the Western world. They don’t have to be afraid of global warming if they support the life of the jungle. 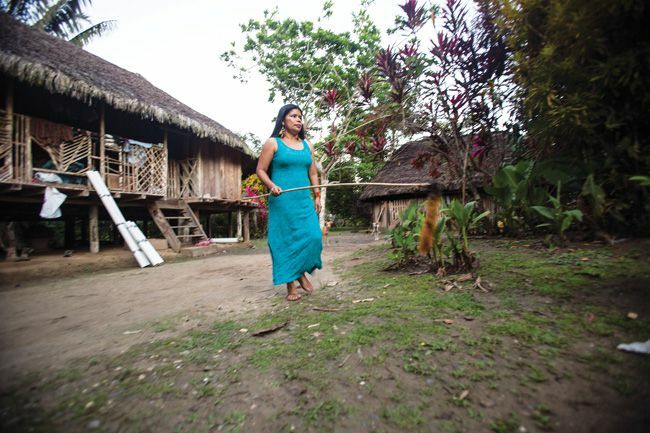 Patricia Gualinga, a community leader who has traveled the world speaking out in defense of indigenous rights, at her home in Sarayaku, Ecuador. Photo: Caroline Bennett / Amazon Watch. 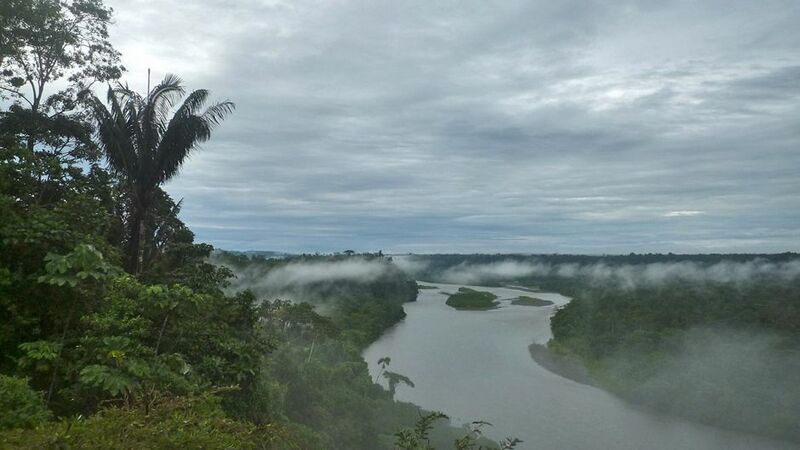 Despite pursuing Chevron for damages, the Ecuadorian government of President Rafael Correa has embarked on an aggressive new round of oil development in southern Ecuador, opening thousands of acres to exploration. The government has cracked down on resisters, recently ordering the closure of the Quito headquarters of CONAIE, Ecuador’s national indigenous organization, attempting to stop Ecuadorian activists opposed to oil drilling from attending a UN climate summit in Peru, and closing Fundación Pachamama, an NGO supporting indigenous groups. 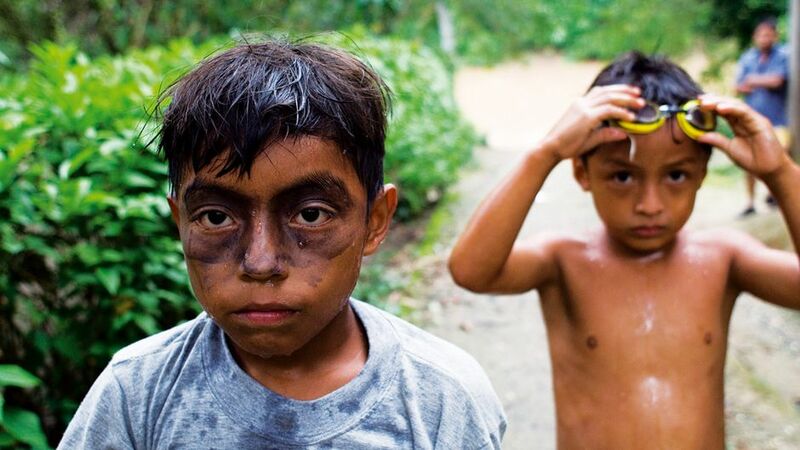 Most of Sarayaku’s land has been excluded in the new round of oil drilling, though nearby communities, including those of the neighboring Sápara people, are threatened. Sarayaku is joining the protests of its neighbours. Women have been at the center of the indigenous resistance. Patricia Gualinga tells me, “The women have been very steadfast and strong in saying we are not negotiating about this. We are the ones who have mobilized for life.” She recounts how, in 2013, 100 women from seven different indigenous groups marched 250 kilometres from their jungle communities to Quito, where they addressed the National Assembly. In the 1990s, Patricia’s mother embarked on a similar march with thousands of other indigenous women. Sabino Gualinga, traditional healer and community elder. Photo: Caroline Bennett / Amazon Watch. Deep in the Amazon, a Tiny Tribe Is Beating Big Oil by David Goodman is licensed under a Creative Commons Attribution-NonCommercial-ShareAlike 4.0 International License. Permissions beyond the scope of this license may be available at http://www.yesmagazine.org/. David is a journalist, a contributing writer for Mother Jones, and author of 10 books. He and his sister Amy Goodman, host of Democracy Now!, have co-authored three New York Times bestsellers; their fourth book is due out next year. He hosts “The Vermont Conversation”, a public affairs radio show.